This month we have seen what seems to be a start of an amazing fishing season here in Magdalena Bay. The waters have warmed, turned blue all the way into the mouth of the bay and the fish are out and about. Mike Tribe’s trip with Anglers out between the 9th and the 16th both inshore and off saw a ton of action, though had some bad luck as well. The good news is there are tons of Marlin moving in and striking trolled lures, the bad news is they dont seem to want anything to do with a mackerel thrown right in front of their nose if they are fin cruising. It is a little strange seeing 30 marlin and none of them wanting to eat, but that is how it goes. We did have 5 marlin strikes and 2 on but as luck would have it 3 were short bites and the two never made it to the boat. The tuna are everywhere and striking anything thrown at them. Tons of yellowfin, easy limits for all anglers if we target them. That made up a good portion of the offshore ridge fishing. 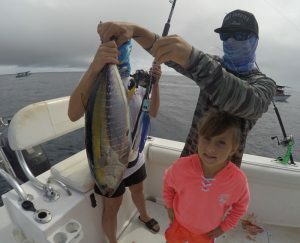 The dorado are around but nothing consistent yet. 3 days offshore and only 3 dorado all on the smaller side. But they definitely are starting to show. The Wahoo are quite elusive. The first day out on the ridge we wanted to make sure all clients were pulling on fish, so we had several fluorocarbon leaders out with magbay lures for tuna, dorado, marlin, etc and the wahoo went nuts. We lost 6 lures in a matter of hours and by the time we switched everything to wire the wahoo slowed and we only ended up with one nice Wahoo that day. The great news is they were there, the bad news is we lost a bad percentage. The next day wind came up and we had to stay inshore. We went back out the following day, wire on everything, no messing around with tuna. The water on the Thetis was only 75, there was red crab everywhere and nothing was striking. Just 2 days prior the same water was 80 degrees. We saw the tuna eating the crab and got nervous that even they might not want to eat our lures and bait but that wasnt true. They even hit the desperado series lures with the wire non stop. After about 2 hours and no wahoo, we figured they moved to the warmer water off the thetis. We switched gears to tuna and had close to limits for everyone in a matter of hours with 8 fish on lines at a time and only 5 Anglers, it was pretty fun. We found a temp break after loading up with tuna, put out the spread, found a big blue marlin hungry took the pez fuerte Marlin lure and was fish on, shortly after was fish off, sad. 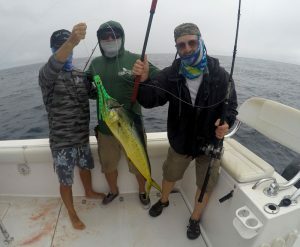 Then we found a decent bull dorado and landed it to end up the day close to limits for 5 but no Wahoo that day.